Embarkation at 15:30. Check into your cabin for dinner. After dinner, the passengers can spend the evening at leisure to enjoy this seaside resort and its nightlife. Overnight in in Marmaris harbor. After breakfast, continue sailing to Ekincik. Visit "Dalyan Caunos", the estuary, Caretta caretta beach and Wander the wonderful nature of the delta before you arrive arrive at mud baths to relax. Overnight at Ekincik bay. Early cruising to reach the world famous Gocek Gulf, anchor at Sunken Bath for breakfast and swimming, sail to Tersane Island. Dinner and overnight stay at Kizil Island. 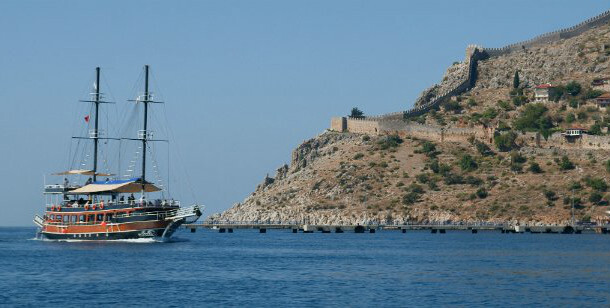 Arrive to Fethiye Harbor, the city of light famous for its prophets, cruise to Samanlik Bay for lunch and swimming. Afternoon anchor at Ece Saray Marina for dinner and overnight stay. Breakfast, cruise to Yassica Islands. Lunch will be taken in this beautiful chain of little islands and snorkel the crystal clear water. Dinner and overnight in islands of Gocek bay. Breakfast, cruise to Bedri Rahmi Bay then to Sarsala Bay. Continue to Aga Limani before lunch and Overnight stay. Breakfast then sail to Kumlubuk Bay with swim stops along the way. Tea is served at 5 pm somewhere in the vicinity of Cennet Island then cruise to Marmaris port for Overnight stay. Breakfast and disembarkation at 10:30 AM. End of our services. Children between 6 and 11.99 years would pay 50 % adult price.